Final exams and the weeks prior can take a toll on students as pre-testing anxiety builds and the desire to procrastinate seems increasingly appealing. Caffeinated beverages replace sleeping, and dark circles under student’s eyes seem permanent. To avoid stress from consuming your life, Dr. Barry Wolf, Psychologist and Learning Support Specialist for Albion College, provided several suggestions for managing time at the end of the semester. A student's stress gets the best of her. 1. Focus on the process, not the final grade. 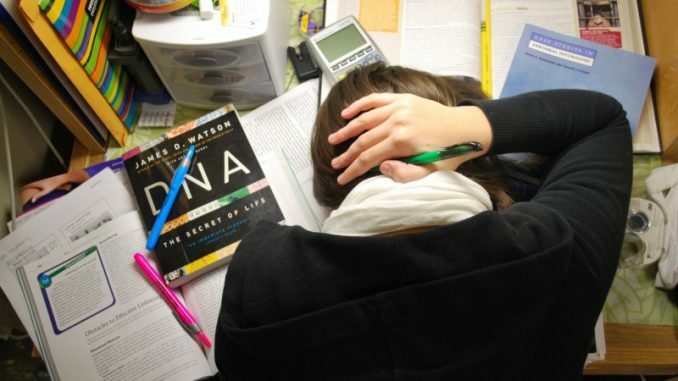 Studying in a dorm room may lead to interruptions by distracting visitors. 3. Find an effective location to study. Dr. Wolf suggests the library, the 4th floor of the Kellogg Center, the Science Complex, or other places that are “quiet, boring, and have limited stimuli” as productive study spots. Wolf also added that the best time to study is during the day. A to do list helps organize tasks. Rather than viewing your workload as an overwhelming mass of tasks, Wolf recommends breaking your assignments down into small, manageable tasks. When all else fails, call Mom. 5. Take care of the basics: take breaks and keep calm. “Don’t just study non-stop. It’s important to balance between work and play,” Wolf said. A good amount of sleep, eating well, frequent exercise and limited partying are additional suggestions Wolf has for students to avoid too much stress. Happiness and staying in control of your stress level are basics that student can easily forget about during exams. Wolf encourages that they use supports such as professors, the Academic Skills center, Counseling Services, friends, and family when students feel they are under too much pressure.